It's been a while since I've done a watercolor sketch. Too long of a while. I had a little bit of downtime to explore Indy, too. I even got to hang out with my best friend from childhood, which was a lot of fun. Actually, every time I go to Indy, I end up having a lot of fun. What a great city. What a crazy, incredible year! I've been lucky enough to have had quite a few opportunities to do work for some really cool clients. And so, naturally, I'm super excited to share this new work with everyone - as it was months in the making! Just to give you a little background here, Pampered Chef held its annual National Conference at the Rosemont Theater just outside of Chicago, Illinois this past July. Every year, their consultants come together for this event to share their love for everything Pampered Chef. 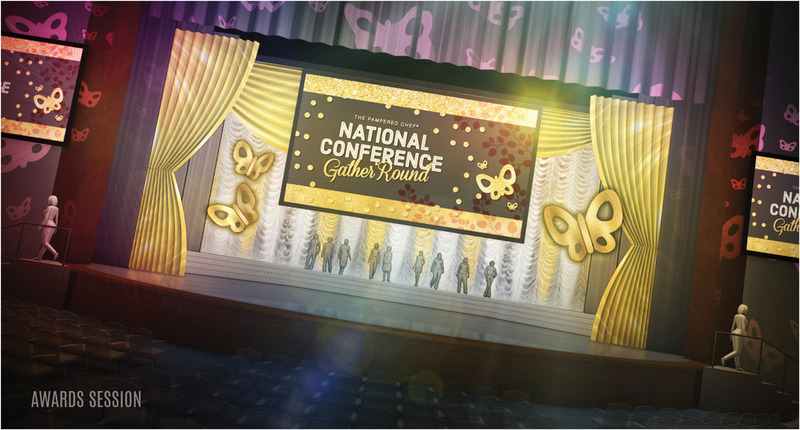 To help make this event be as super awesome as it could be, I worked closely with the Strategy, Staging and Design teams at my company to develop the initial stage concepts/looks for each general session. In additional to working with those (internal) teams, I also simultaneously worked with creatives from the Pampered Chef team to develop set looks that suited their specific needs. And the result is what you see below! The overall theme for this year's event was Gather 'Round. Each day used similar colors (pinks, glitter(s) and gray) and materials but the graphic and scenic elements were designed differently to create a robust, unique look for each general session. This helps create a fine distinction between each session for the attendees. General Session 1 was largely inspired by chevron shapes. A combination of hard and soft pieces were used in harmony to create a layered effect. Bogo lighting can be seen on the stage sides and top center to further carry the look of the day. The speaker support (screen graphics) also reflect the inspiration of the day. Geometric circle shapes and patterns are what drove the look of General Session 2. Varying sizes of Chinese lanterns covered in glitter dangle from the stage ceiling. Circular patterned hard panels line the legs of the stage with semi-transparent fabric draped behind to create textural contrast. The speaker support uses similar elements graphically to enhance the circular, geometric theme. For the Awards Session, glitz and glam were the driving themes. The butterflies are symbolic of blooming/achievement. Lush swags of gold and silver fabrics are used in the background and foreground to create a rich, dimensional space for attendees and presenters to stand, enter and exit. Balloons, although not visible in the 3D render, are netted against the ceiling above the theater seating; these are to be used as a finale to the evening. General Session 4 is inspired by hexagon shapes. Floor and ceiling supported hex clusters are used to create visual interest in space and aesthetic. Each cluster is made up of colored, semi-transparent and opaque shapes. Soft fabric columns are use on stage right and a large sheer fabric is used on stage left; both work together to create an asymmetrical tone. *Although these weren't the final set or speaker support looks the client landed on for the actual show, they were a great start/foundation to the 2015 final event look! I'll be sure to post some photos from the show at a later time! It was there that I was the lead on-site Grpahics Operator, which is a whole other ballgame compared to the set design stuff! Fun times!